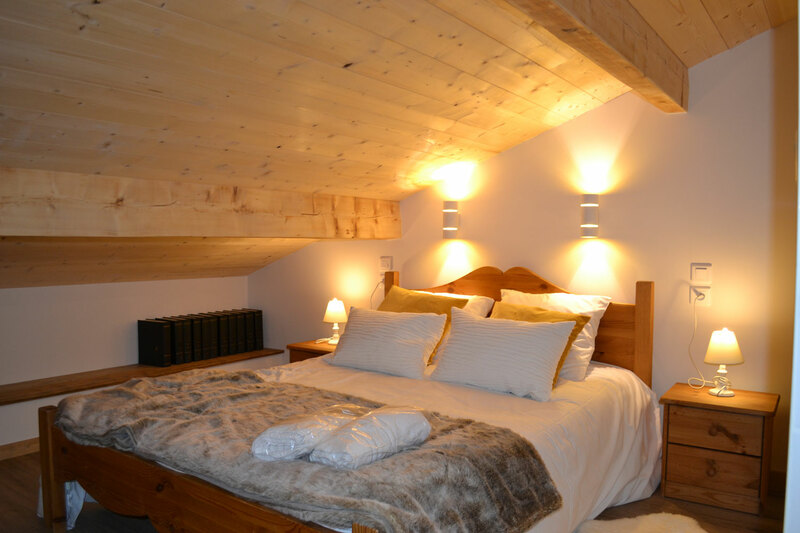 Chalet Mugnier, luxury accommodations Samoens, France. 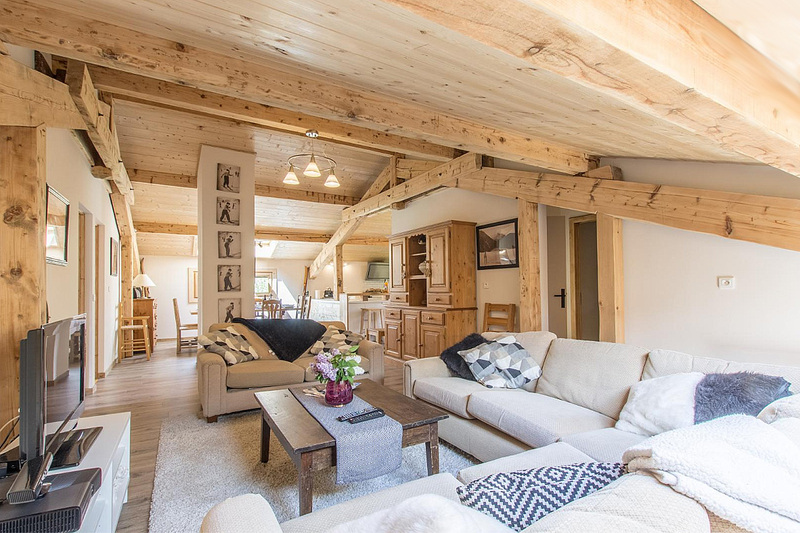 Luxurious and spacious apartments in Samoëns. 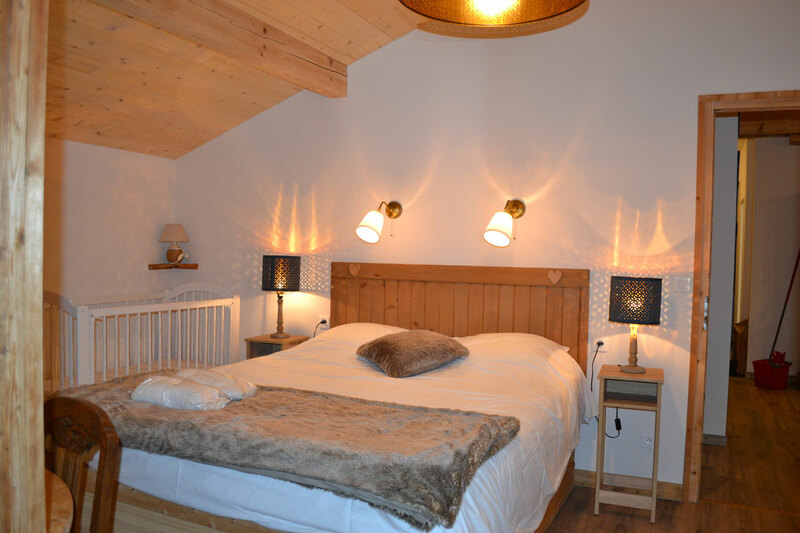 The chalet Mugnier sleeping 8, in a prime location within the centre of Samoëns. 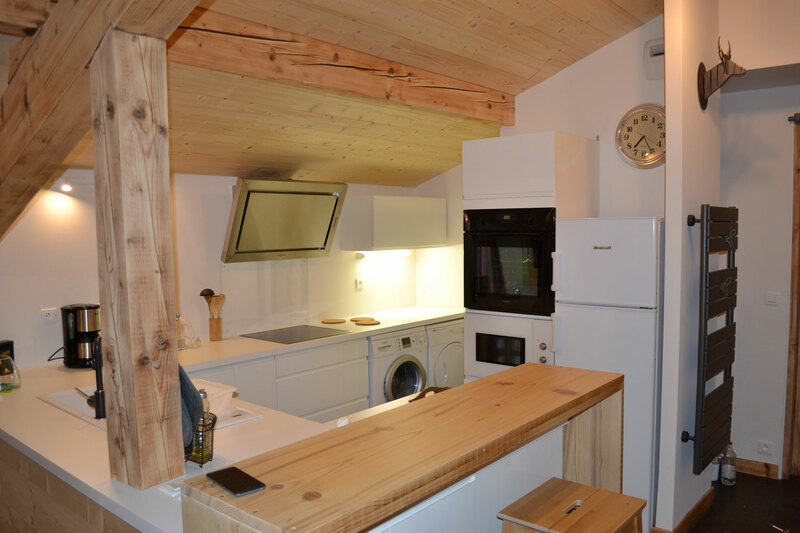 This 3 bedroom apartment of 110 square meters is in a Savoyard style with mansard-roofed ceiling chalet located at "La cour". The place is calm and not far away from the centre and Grand Massif Express lift. Ideal for families with kids with its one way access, children can play around safely. 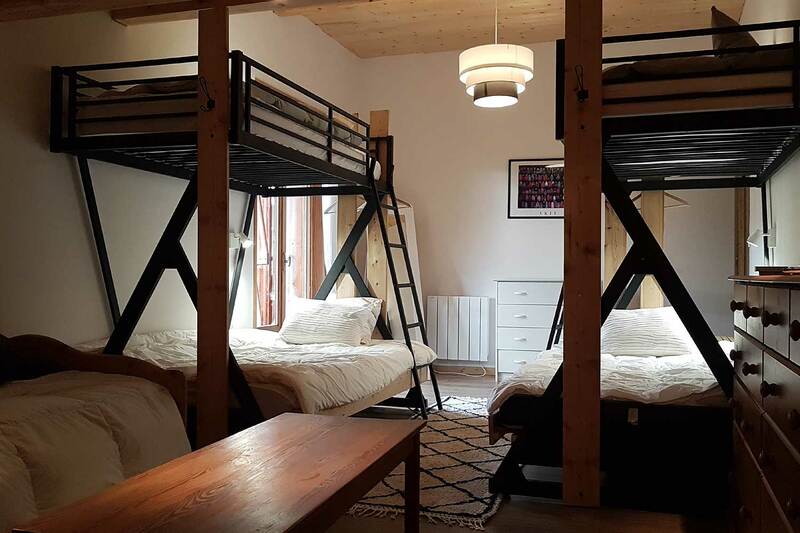 The flat is suitable for 8 people and rated 4 stars. 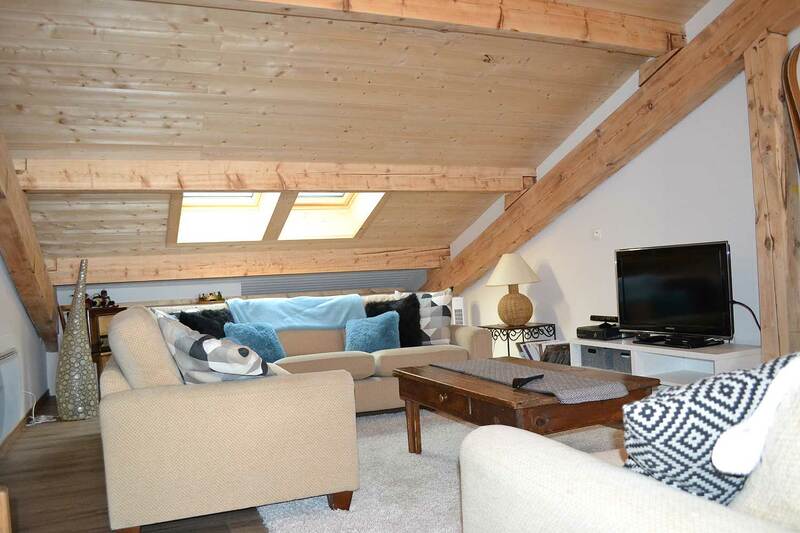 3 bedrooms with one en-suite, open kitchen on dining room, a large sitting room, 2 wet room, 2 toilets, 1 large balcony (facing south), little balcony facing north, 1 terrace at the ground level with garden table, chairs, armchairs and parasol. The apartment is furnished with all the modern equipment to meet your requirement: Dish washer, washing machine, dryer, fridge, oven, micro wave, satellite TV decoder, dvd player, XBox 360 with games, stereo with dock station. 2 private parking places, equiped SkiRoom (2018/2019) and Bike locker. December the 15th 2018 to the 21th April 2019. The Samoëns ski area offers a varied playground accessible to all. For expert skiers there are black and red pistes at the top of the resort and a vast off-piste area to indulge your enthusiasm. Small children are welcomed at the children's ski area (jardin d enfants) at the top of the Grand Massif Express cable car. The Grand Massif is the 4th largest ski-linked area in France. It has a total of 265km of pistes and rises up to an altitude of 2500m. Surrounded by grandiose scenery, the Grand Massif affords a truly breath-taking panoramic view of the French side of the Mont Blanc mountain range. The 5 linked resorts - Samoëns, Flaine, Les Carroz, Morillon and Sixt - are set in remarkably diverse, yet complementary locations. Altitude resorts, ski-in ski-out resorts, car-free village and village resorts; each offering amazingly quick access to the Grand Massif's 144 pistes. july and August: "Adopte 1 col"
Calling all cyclists, the Joux Plane's pass is all yours! A message to all cyclists: we've reserved 2 mountain passes just for you on July: the pass of the Ramaz and the pass of Joux Plane on August ! The road is off-limits to car traffic on both days. Refreshments at the top of the climb. For motorsport enthusiasts. The Mont-Blanc Rally is an automobile rally counting for the French Rally Championship and for the French VHC Rally Championship. 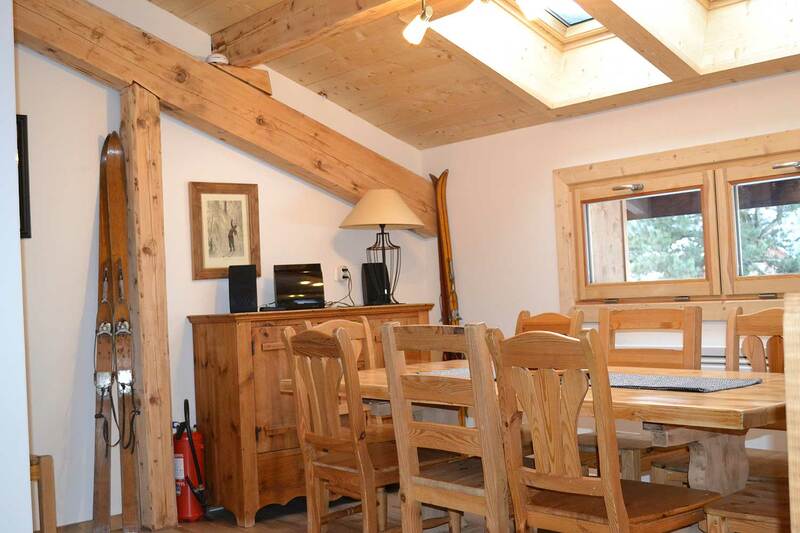 The chalet is located right between the centre of village and the Grand massif express. Large dinning room opened on siting room. The table is suitable for 8 people and can fit 10 .. The living area is as big as it could possibly be. Exposed to the south, you'll apreciate the view and silence while having your breakfast... in summer ..
New for winter 2019 ! 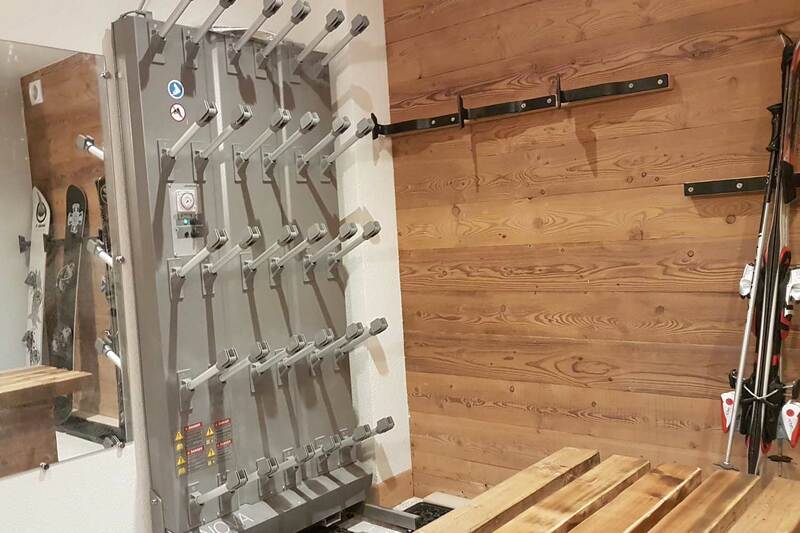 The ski Locker with boot dryer is ready, ski racks, shelves and workbench. Little but all requirements with en site shower room, internet TV. This terrace is well exposed and has all furnitures needed to spend lazy days or just rest after your walking or cycling. Explore the village of Samoëns, its history, its character and its everyday life in the heart of Haute-Savoie. To find out more about the village, check out its strong points. The 8-minute link between the village and the 4th largest skiing area (the Grand Massif - 265 kms of pistes). Its accent on holidays for families and children thanks to the 'Famille Plus' quality label. Its 46 kms of cross-country skiing in the valley and 30 kms higher up the slopes (Col Joux Plane - Alt. 1700 metres), its 15 signposted snowshoe trails and special-interest outings. Its quality of life: take time to enjoy every moment. Its wide sun-drenched valley with flat floor. Its ease of access (motorway to Cluses, then a mere 20-minute drive to Samoëns at any time of year). The Haute Savoie offers great opportunities summer and winter with its lakes (Lake Annecy and Lake Geneva), mountains such as the Mont Blanc ski resorts and international events throughout the year. Highly cultural place, Haute Savoie welcomes you and offers many visits and discoveries to be made throughout the department. So you will find in the culture pages with the link above sites and monuments, museums, cultural venues or even the activities and company visits. An ideal game for those who like to discover in depth the Haute-Savoie. 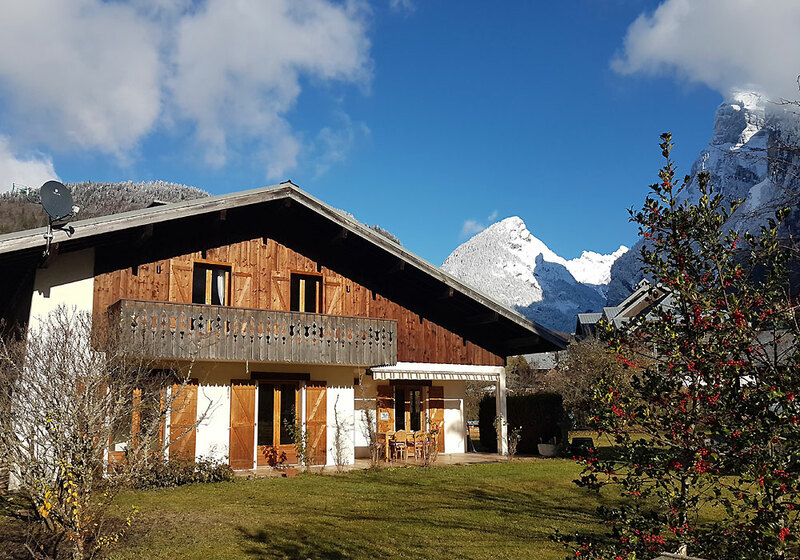 Whether you prefer a gentle stroll in the countryside, a chance to test your physical limits as part of your holiday or a well-deserved relaxing break in the mountains, Samoëns provides just what you're looking for ! Come and try out the downhill mountain biking trails. The mountain biking area is being extended - there are now 169 km of trails! Explore a larger mountain biking area on the Grand Massif when the skilifts open this summer. You're bound to enjoy an adrenalin rush with a 1,400-metre drop in altitude between the Tete de Saix and Samoëns or Morillon (the lowest points in the biking area) and a choice of black, red or blue trails. Samoëns and the Grand Massif offers 350 km of marked tracks for Mountain bikers. To contact us and make a pre-booking or a booking, go first to the Term and Condition page, check availability and price listing fill the form with your special request at contact page. All year round, we offer 20% off the second week and 30% off the third week running.